Two coats with top coat. I think if I were more careful, I totally would have gotten away with just one coat. Fantastic pigmentation. Smooth application. Glorious. Pic of the Moment: So last week I was Chicago visiting family. 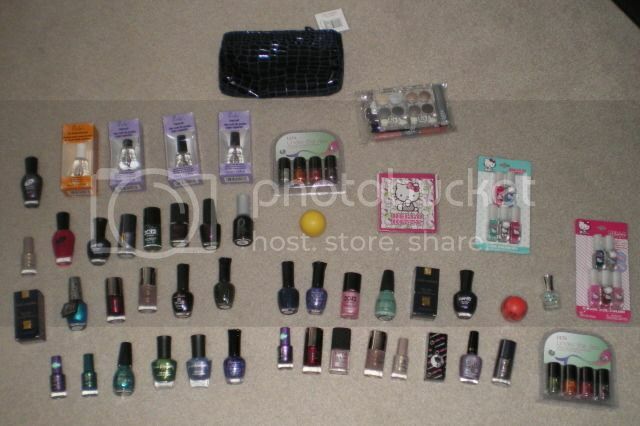 As it was my first ever trip down in the States, I hauled nail polish like nuts. Hahaha. Here's a pic of my haul. Half of it's for StBFF. And notice my multiple Poshes. So happy I have a backup stash as I don't have access to them at home. I got to try the famous Chicago deep dish pizza while I was down there. Pretty good, but not as great as I think I hyped it up to be. Also tried Popeye's. I will admit, that's some good chicken and I crave more. You didn't do too bad, haha. I was worst when I was down there shopping. But post more often, will ya? I spot a minty, jade green and Essence nail polishes! What are the two bottles to the right of the OPI Shatter? Ooo! 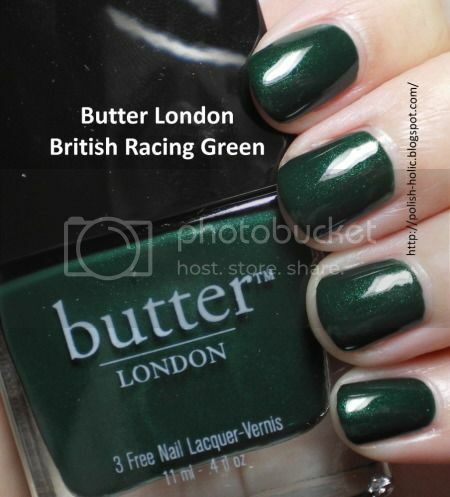 Racing Green is really gorgeous!!! Love it! <3 And love your haul - that Ulta set is really amazing, especially for pedis. The colors have such a beautiful glass fleck finish! I wish they made full sizes of those. :D Enjoy your new pretties! Nice haul! And I love the green. oh my! I love dark greens!! it looks gorgeous! Halifax: I don't know what's been up. Haven't felt the words flow. Also, feeling to ADHD to sit down to write lately. idrinknailpolish: I'm so excited to try that little set. They look so awesome! Mandy: I so didn't get those HK polishes to wear. Purely for Sarah's collection. They didn't look all that great. I'm a late this party, but that's a nice sized haul. I do love those mini HK polishes. My daughter got a set for her birthday and the colors are super cute! Also, yes, Popeye's is delicious. One of the only places I miss eating at since I've cut fast food.